Chakras are often described as small, rotating vortices of energy that run vertically along your spine, centered in the core of your body. These energy centers are designed to metabolize physical vibrations, essentially breaking energy into parts, much like your digestive system, and distributing it to your whole body via your nervous system, endocrine glands, blood, bones and muscles. 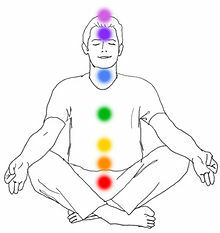 In this way, the chakra system provides energetic nourishment for your physical body. Consciously moving energy through these points increases and balances your body—physically, mentally and emotionally. When your chakras are open and freely circulating energy as they are designed to, all of your body’s systems receive the nourishment they need to function at their best. … become familiar with how each chakra functions and is related to the three body weights, specific emotions and the movement of energy. Moving all three body weights helps open and circulate energy through your whole body via the chakra system. Become aware of these centers as you move to locate areas of blockage in your body. Begin by paying attention to one chakra at a time as you dance with your three body weights. Remember: your movements do not need to be big to move energy; all movement stimulates breath, emotions and a shifting of energy. Be gentle—a little movement goes a long way. Always ground before and after doing any chakra work and breathe deeply throughout your practice. Pay close attention to the effects of your experience. If you feel jittery, unbalanced, out of sorts, or edgy, slow down. These signals are the voice of your body telling you to do less. In the beginning, less is more. The first time I heard about the chakra system, I nearly sprained my eyeballs from rolling them so much. Oy, with the new age, woo-woo, freaky energy thing! It sounded like a bunch of hooey to me. I can see and feel my feet and legs and core and arms, but I can’t see my Heart Chakra. While it is true that most people can’t see the chakras (evidently, some people can see auras which can include the chakras), everybody, even skeptical me, can feel them. Just as physical movement has sensation, thoughts and emotions have sensations and we feel those sensations in the chakras. CHARLOTTESVILLE NIA STUDENTS: In my classes on Wednesday (acac Albemarle Squre 1055am) and Thursday (acac Downtown 9am) this week, I will teach the special silent ChakraDancer routine which uses music that is tuned to the vibration of each chakra and uses movements designed to open the physical and energetic centers in the body. Please join us!